Institute manager Paddy McLaughlin watched his side easily beat Knockbreda. Institute easily seen off Knockbreda to progress to the Tennent's Irish Cup sixth round. First half goals from Gareth Brown and Aaron Harkin meant Paddy McLaughlin's side were always in control and in truth they could have won by a bigger margin. In fact midfielder Harkin, who had a super game throughout out, saw two efforts in the second half rattle the woodwork. Just like when the sides met in the league earlier in the season, it was the visitors who got off to a flying start thanks to striker Brown. The front-man latched onto Niall Grace's clever pass on seven minutes, before calmly slotting the ball home through Knockbreda goalkeeper David Ferguson's legs. Institute with their tails up should have doubled their lead on 14 minutes but Mark Scoltock, seen his close range strike saved by a diving Ferguson. Breda missed a golden chance to level things on 22 minutes but striker Kyle Mackie, who was totally unmarked, somehow headed over from five yards. Just before the half-hour mark, Stute's Grace seen his 25 yard pile driver superbly tipped away by a fully stretched Ferguson. Institute were awarded a controversial penalty on 39 minutes as Kris Pike's well timed tackle on Jake Morrow, strangely lead to referee Peter McGrath pointing to the spot. 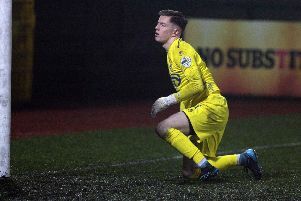 After the Breda protests were waved away, Stute midfielder Harkin made no mistake from 12 yards, slotting the ball high into Ferguson's top left hand corner. The home side had the first chance of the second half, but striker Mackie saw his well drive from the angle, saved by an alert Gallagher. On 55 minutes Harkin latched onto Ronan Wilson's cushioned lay-off, but his stinging 20 yard strike was saved by Ferguson. Minutes later the woodwork came to the Belfast men's rescue as Harkin's 25 yard free-kick, which had Ferguson beaten, rattled the crossbar. On 73 minutes, that man Harkin was inches away from grabbing his second goal of the day, but his curling effort from just inside the box, once again hit the crossbar. In final quarter recent signing Sean McCarron and skipper Michael McCrudden both came off the bench for the visitors, who had started to take their foot off the gas, as they cruised into the next round. Knockbreda: Ferguson, Culbert, Pike, Hamill, McBurney, McVeigh, Irwin, Mackie (Halliday 70), O'Hanlon (Doran 73), Young. Institute: Gallagher, Morrow (Jarvis 81), Bonner, Scoltock, Curry; Wilson, Grace, Harkin; Morrow, Brown (McCarron 72), Dunne (McCrudden 68).